If you are planning on making your way to the high seas, you want to make sure that you are ready to give Mother Nature your best. Whether you are considering building your own boat, or shopping for one, your education begins by obtaining a clear understanding as to how a boat is constructed, and which construction techniques and designs will complement your individual needs. At the end of the day, you want a high-quality vessel that is not only affordable, but is also durable and performs well. When it comes down to brass tacks, it is all about the center console, really. One of the most common questions related to the construction of a boat pertain to the techniques used to secure the boat deck to the boat liner. This brings up the question about 2-piece or 3-piece hulls. If you are confused about which to choose, this article will discuss the corresponding attributes of each and should hopefully help you choose. Difference between 2-Piece & 3-Piece Hulls = 1 piece? Before we discuss the advantages of each, you should first understand how 2-piece hulls and 3-piece hulls are different from each other. In the simplest terms, the main difference of the two revolves around how the boat deck is secured to the boat hull. In boat construction involving a 2-piece hull, the boat deck is secured to the boat liner with rivets and/or screws, and adhesive. If these screws or rivets come loose, or the adhesive agent of the glue wears off, it could lead to potential issues in the future. In addition to that, the overall ride of the boat tends to not be as “solid” when compared to other hull types, mainly due to the jarring impact that results from the shock of the waves being distributed by two separate hull pieces when progressing through waves. On the other hand, in boat construction involving a 3-piece hull, the boat deck is secured to the boat liner by fiber-glassing the two pieces together to provide a much stronger bond between the two. This results in a lack of shifting and an overall more comfortable and smooth ride as well as stronger construction which has been bonded together. Generally speaking, 2-piece hull construction is not regarded to have many advantages for the owner in terms of usage or construction. The primary advantage is reduced manufacturing cost, which results in a lower priced boat and of course can be a big advantage in terms of purchasing. A 3-piece hull boat construction gives boaters a tow kick area, which allows their knees and feet to slip under the gunnel. This is especially useful for fishing enthusiasts since it offers a much-needed stability when fighting a fish or any such activity which requires them to lean against the sidewall. No more stubbed toes! Unfortunately, in a 2-piece hull, there isn’t any tow kick area, leaving your knees to take the beating since your toes are more stuck in. The liner is pushed directly against the hull in a 3-piece boat construction. This means more deck space up to 6-8”. On the other hand, a 2-piece construction is fairly cramped speaking, since it has a different mold and cap design which makes it difficult for the boat liner and hull to come flush together. If a fishing boat is what you are interested in, what is one without spaces for fishing rods? Rod holders are one of the most important components of any fishing boat, and the terrific aspect of 3-piece boats is that you can install rod holders virtually everywhere. This is not the case with a 2-piece boat. Underground gunnels can easily be accessed in 3-piece boats and therefore rod holders that have been installed can be bolted down. The poignant part is that this isn’t a time-consuming task and can be achieve easily. In addition to that, the rod holder drain directly onto the deck of the boat. On the other hand, in a 2-piece construction, the rod holders can only be screwed down from the top. This means that one either has to risk them draining directly into the hull, or run hoses all around for proper drainage. 3-piece boats are much easier to install in terms of lighting and outlets, such as DC outlets for electric reels, shore power, and so on as compared to 2-piece construction. With 3-piece construction, these outlets stick out so much that they get caught on your legs when you are running from one side of the boat deck to the other. On the other hand, with 2-piece construction, lighting and outlets remain in the open so there is no way to conceal them. This makes it look unsightly and increases the chance of you sustaining any bruises, cuts, and scrapes. Coaming pads are used all over with 2-piece construction to give boaters some extra room. However, the deck area is compromised and it pushes the costs higher and involves more maintenance. 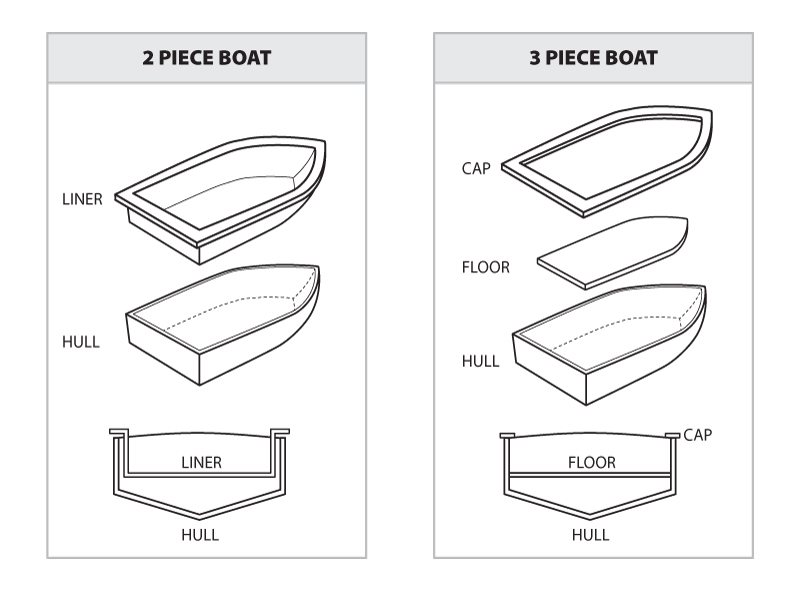 In a 3-piece hull, coaming pads aren’t necessary, but an option that boaters can choose to install or choose to do without. Many do choose to install them as they can still greatly increase the comfort and reduce bruising on legs or thighs when fighting fish standing against the cap. All things said and done, apart from the cost factor, a 3-piece boat hull is superior to its 2-piece counterpart in both usage and construction methods. If you want outstanding durability, more deck space, and a better ride over all as you are blazing through the water, you should strongly consider a 3-piece hull. 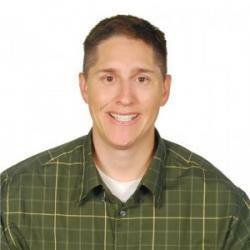 Benjamin grew up fishing and exploring the Northern California coast on his family’s boats. He’s traveled the seas aboard USS Oldendorf and USS Fletcher while serving in the US Navy. He’s lived, boated and fished in Korea, Saudi Arabia, Cabo San Lucas, Mexico among other places.